Shrimp Diablo is a fast and fiery Mexican dish for those who love a spicy kick! 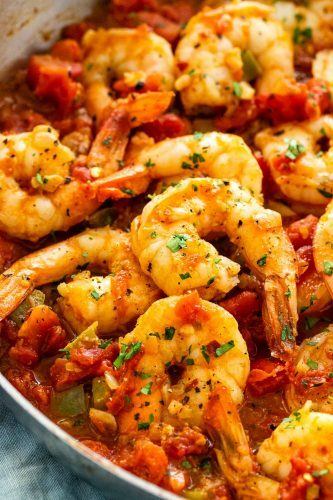 Succulent shrimp are sauteed with red pepper flakes, jalapenos, garlic, onions, green bell peppers and simmered in a rustic tomato sauce. Ready in just 30 minutes for a bold and flavorful meal. We love shrimp recipes at our house. You also have to try this Shrimp Fried Rice, Sticky Honey Garlic Butter Shrimp. or this Cajun Shrimp and Sausage Skillet. Chili lovers, this spicy seafood dish is for you! Jumbo pieces of shrimp are cooked in a chunky tomato sauce infused with two sources of hot peppers. It’s a simple and quick meal that delivers some serious devilish heat. 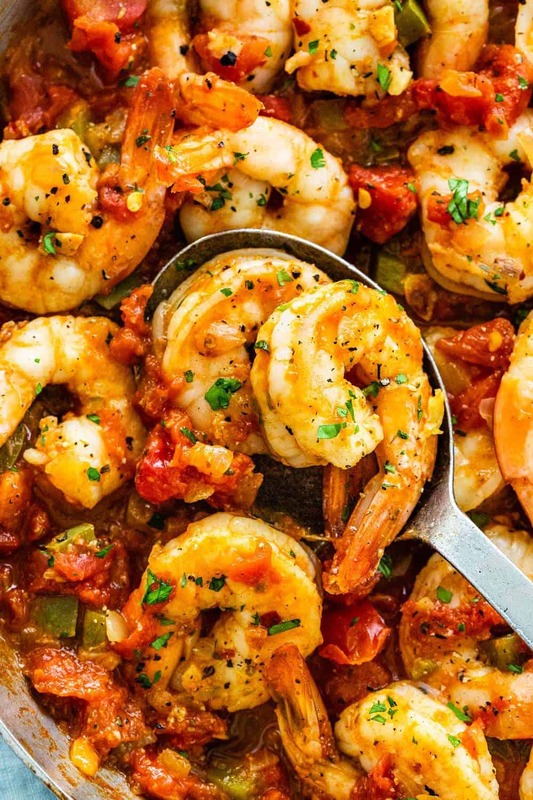 If you’re on the hunt for more bold shrimp recipes then try Sweet and Sour Shrimp, Easy Shrimp Creole, or Blackened Shrimp Fajitas to make dinner much more exciting. One of the hallmarks of Mexican cuisine is the use of robust spices and chilis. This peppery seafood dish showcases fresh chopped jalapenos, dried chilies, smokey tequila, oregano, thyme, and tomato combination. The sizzling shrimp in the fiery diablo sauce and vegetables satisfies all of your hot cravings. Serve this dish as an appetizer with crunchy bread for dipping, Spanish rice or pasta for a tasty entree. 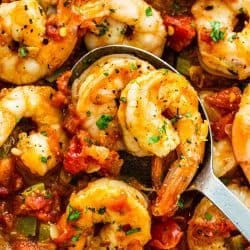 How do you make Shrimp Diablo? Season shrimp with red pepper flakes, salt, and pepper. Saute garlic, jalapeno, onion, oregano, and thyme in olive oil in a large skillet until fragrant. Add shrimp, heat until cooked through then transfer to a plate. Saute bell peppers with the other vegetables and herbs. Add tequila, stock, tomatoes, and salt, simmer until slightly thickened. Add shrimp back into the pan to heat through. What kind of shrimp do you use? The best type of shrimp to use is sweet white shrimp, however, any variety will work well such as pink or brown. Make sure that the shrimp are peeled and deveined, it’s cooks choice whether or not to keep the tails on. One important decision to make is the size of the shrimp. I often use extra jumbo size, which is purchased at 16/20 count. It’s a generous size that doesn’t overcook too quickly in the hot pan. The shrimp is tossed with dried crushed chili flakes before cooking. The capsicum coats the surface for maximum heat and flavor transfer once it hits the hot olive oil in the pan. What goes into the diablo sauce? This spicy diablo sauce uses tomatoes as a base similar to a marinara sauce. It starts off by sauteing the aromatics like garlic, onions, thyme, and oregano. Blooming dried spices in oil dissolve the fat-soluble flavor compounds for a stronger herbaceous taste. To bring the heat, fresh jalapeno’s and dried red peppers give a subtle upfront bite with a lingering sizzle. Simmering aged tequila, vegetable stock, and tomatoes create a rich and concentrated sauce to toss with the shrimp. Looking for more spicy seafood recipes? Try these ones! Shrimp diablo sauteed with red pepper flakes, jalapenos, garlic, onions, green bell peppers and simmered in a rustic tomato sauce. 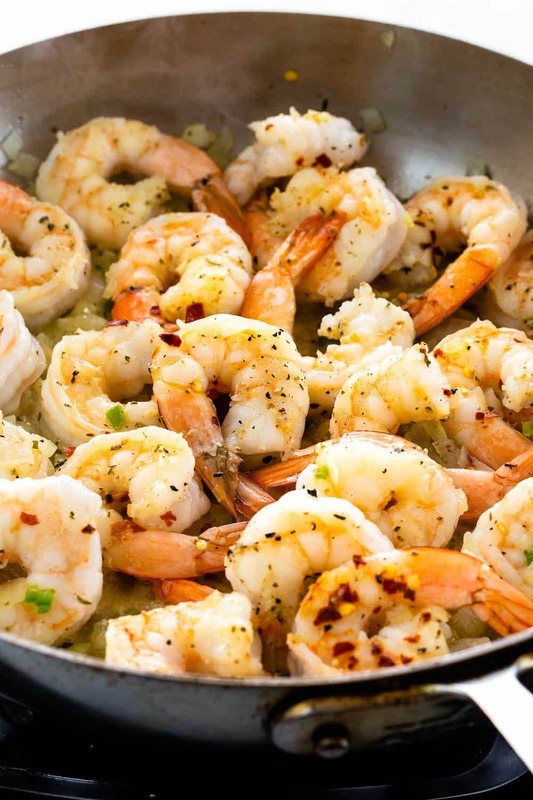 Combine shrimp with ½ teaspoon salt, pepper, and red pepper flakes. Heat a large skillet over medium-low heat, add 2 tablespoons olive oil. Add garlic, jalapeno, yellow onion, oregano, and thyme. Stir and cook until onions are tender and garlic is fragrant but not browned, 2 minutes. Add the shrimp to the pan in one layer, turn heat up to medium. Cook for 2 minutes, not moving the shrimp. Flip shrimp over and cook until just cooked through 1 minute. Transfer to a clean bowl. 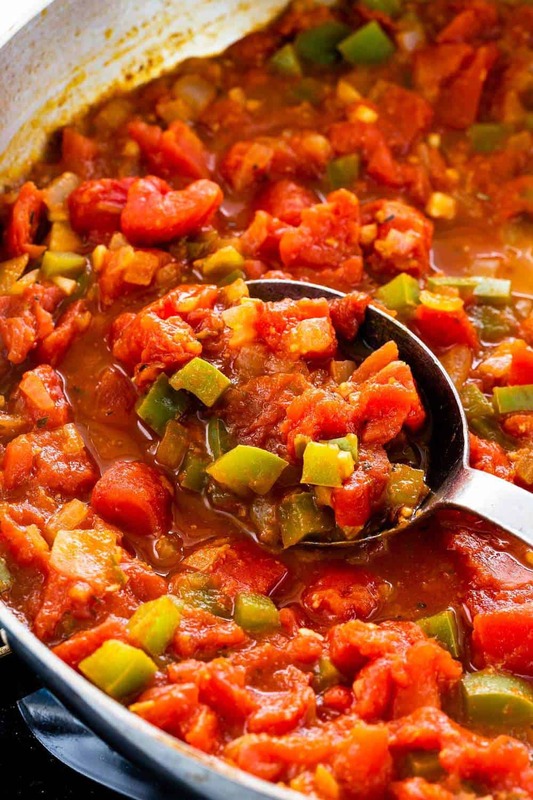 Turn heat up to medium-high, add in tequila, vegetable stock, diced tomatoes, tomato juice, and ¼ teaspoon salt. Bring to a simmer and allow tomato mixture to reduce until slightly thickened and most of the liquid has evaporated about 8 to 10 minutes. Turn heat down to low and add in the cooked shrimp. Stir and cook until shrimp is warmed through, 1 to 2 minutes. Garnish shrimp diablo with parsley.